Packet pickup and check in: On Friday the 23rd packet pick up and check-in will be from 5pm till the park closes at sunset (roughly 8pm), inside Fort Clinch State Park in the pier parking lot. Try to check in on Friday, if at all possible. Otherwise, you can check in on race morning. At this time there is no mandatory meeting or pre-race dinner, but this could change. Race Start: 8:00 AM. The park gates will open at 6:00 AM. Cut off times and dropping down: The full 100 miles must be completed within 30 hours (by 2:00 PM Sunday). The only cut off times during the 100 are at the 18 hour mark (2:00 AM Sunday) by which time you need to have completed at least 50 miles; and 27 hours (11:00 AM Sunday) by which time you need to have completed at least 90 miles. Anyone who does not make these cut off times will be pulled from the course. The 50 miler has a 15 hour cut off. DROPPING DOWN: Dropping down from the 100 mile to the 50 will not be allowed during the race. Whatever distance you register for, that is the race you must finish once the race begins. If you wish to drop down from the 100 to the 50 you MUST INFORM THE RACE DIRECTOR AT LEAST 1 WEEK FROM THE RACE DATE. WEATHER: The weather the past few years has been warm and humid during the day, but tends to be cold and windy at night. Prepare accordingly. Also, because Fort Clinch is a state park, they do not spray for bugs, so bring bug repellent. 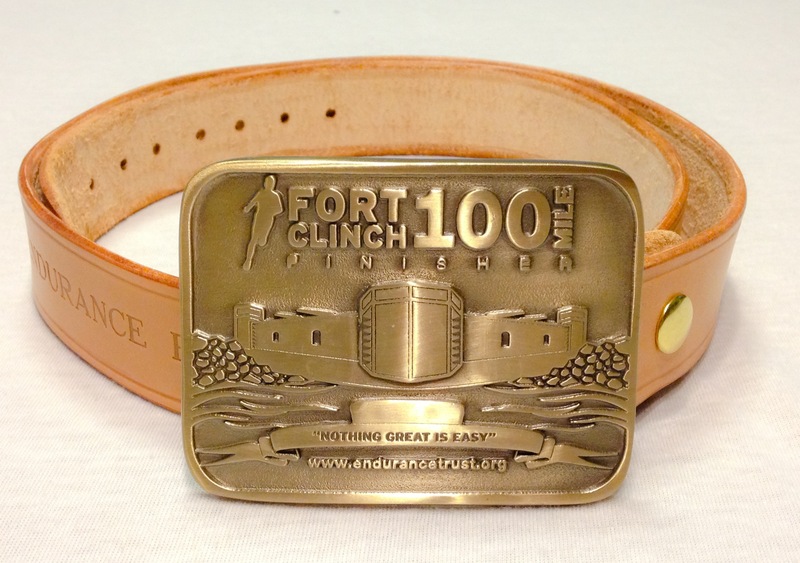 Fort Clinch 100 Finisher Buckle. Belt does not come with the buckle. 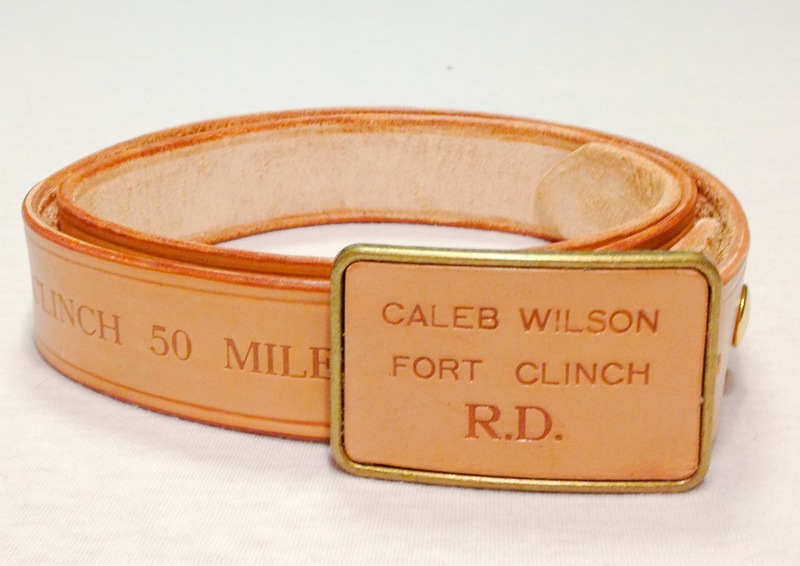 The fastener will have your name and finish time stamped on it. If you have ever been disqualified from a race for cheating of any kind, including course cutting or doping, you are NOT welcome at The Fort Clinch 100. If you have ever been convicted of doping and served a ban, you are NOT welcome at Fort Clinch. All FC100 rules are based on a few simple principles: Play fair, be respectful and don’t be a douche! FIRST AND FOREMOST: OBEY ALL PARK RULES. All participants, whether crew, pacers, family of participants, volunteers or anyone else associated with this race in any way MUST review and remain in compliance with all park rules. SECOND: NO POOPING ON THE TRAIL, PLEASE! Restrooms are readily available. Along with restrooms on the pier and at the visitors center by the Fort, there will be portolet toilets at every aid station. You will rarely, if ever, be more than 3 miles from an opportunity to use the restroom. No smoking is allowed at the Fort Clinch 100, including at the aid stations and start/finish area. Be respectful and follow any direction given by Fort Clinch State Park staff. There will be no unofficial or “bandit” runners. Bandit runners will be asked to leave the park immediately and may be banned for life from all future LRC events. Assisting a bandit runner in anyway, except in case of life-threatening emergency, may result in banishment from all future LRC events. Each runner’s official race bib must be worn prominently on the front of the body and must be easily visible at all times. Runners must follow the course as it is marked at all times. Any runner departing from the official course must return to the point of departure on foot before continuing. If any runner is seen riding in a vehicle or using any other mode of transportation other than their own two feet, at any point during the race, it will be assumed that they have withdrawn from the race and will be mark as a DNF. All runners will abide by the directions of Medical personnel. Failing to remain at an aid station for medical evaluation on request of aid station personnel may result in runner disqualification. Any runner who decides to drop from the race must notify a volunteer at a manned Aid Station. 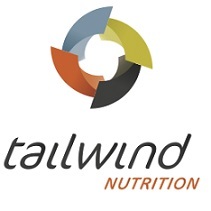 ALL RUNNERS: YOU are responsible for checking in at each manned aid station. The weather will likely be hot and humid. All runners must carry at least one 8oz or greater hydration bottle with them at all times! Runners, pacers and crew should educate themselves on the symptoms of dehydration, heat exhaustion and heat stroke. Runners may not store supplies of any kind along the course. Drop bags will be allowed at the Youth Camp AS and race HQ. There will be trash cans at all aid stations. DO NOT THROW TRASH ON THE TRAIL! This includes leaving cups used for soup or drinks hanging on course markers or vegetation! Anyone, including runners, pacers, crew or volunteers caught intentionally littering will be asked to gather their belongings, will be escorted out of the park and banned from all future Llama Running Company (LRC) events. NO SECOND CHANCES! It is a privilege for us to use this venue. Littering will endanger the future of this race. Please use the trash receptacles provided at the aid stations. Pacers are allowed after 60 miles (6 completed laps) or sundown, whichever comes first. No pacers are allowed at any point in the 50 mile. No more than one pacer is allowed to accompany a runner at any given time. To keep traffic and interference with public use of the park at a minimum, crewing is allowed at race HQ and Youth Camp aid stations or from your vehicle within the pier parking lot only! Crewing outside these areas, whether by foot, vehicle, bicycle or any other method is prohibited. RUNNERS: Please, make sure your crew is aware of this rule. If you are caught receiving assistance outside of the areas designated above YOU WILL BE DISQUALIFIED! 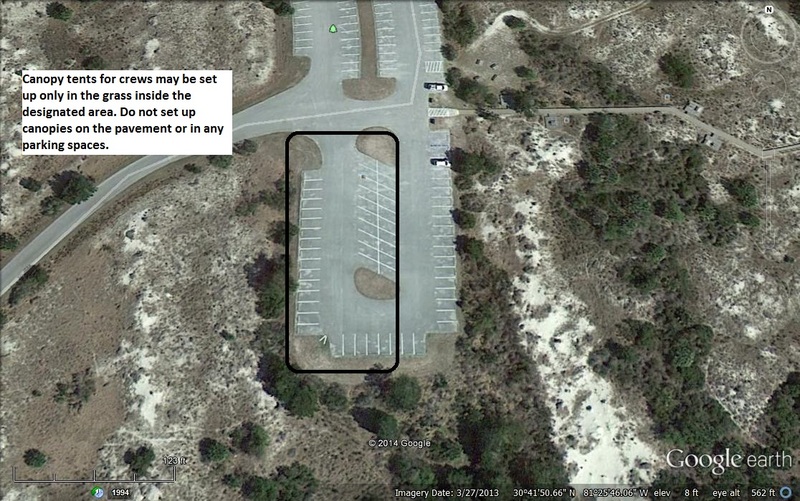 Parking in the Youth Camp area is limited, room for 20-25 vehicles at a time, and the access road is only wide enough for one vehicle, although there are spots to pull off to the side to allow someone past. Please ask your crew to keep travel between these areas as limited as possible. If they can just bring a bicycle to ride back and fourth, even better. Canopy “event” tents for crews and runners can be set up in the Youth Camp. The YC is entirely shaded, so canopy tents aren’t really even necessary unless it’s raining. They may be set up in the pier parking lot as well but only in areas where the grass is mowed. THE LONG GRASS AREAS ARE PROTECTED. The tents cannot be bigger than about 10×10. Please be considerate of your fellow competitors when choosing a place to set up. If possible, just set up right in front of your vehicle. Use the south end of the parking lot only. No crews are allowed at the unmanned aid stations. Crews must adhere to instructions of all aid station personnel, including requests to vacate a certain area of the aid station. Crews driving through the park must drive at or below the posted speed limit. Besides the safety of runners, the park has a lot of wildlife and is also frequently used by joggers and people on bicycles. Please drive cautiously! All unattended children will be given a 2 liter bottle of Mountain Dew and a free puppy. Crews vehicles found in areas where they are not authorized may be towed at the owner’s expense, and their runner may be immediately disqualified. Runners are responsible for the actions of their crews and pacers. Everyone associated with the FC100 must comply with all rules (Race rules as well as park rules), regulations issued by the Race Director in pre-race memos and all parking and access instructions, or risk disqualification of the runner. The using of trekking poles is allowed. Headphones are allowed, but discouraged. If you wear headphones, please, keep the volume at a reasonable level so you can clearly hear what’s going on around you at all times. Keep in mind that part of the course is run on busy road inside the park. The Race Director reserves the right to ask any runner to discontinue the use of headphones if they cause any problems. Refusing this direction may result in runner disqualification. While on the road portions of the course, you are required to stay as close to the shoulder as is reasonable. If a vehicle is coming at you then step off the road. Runners must yield the right of way to all vehicle traffic! Do not make vehicles swerve around you. If you are seen impeding traffic on the road you will be DQ’d! No warnings, No second chances. This a safety issue, as well as making sure the public can still enjoy the park unimpeded during the event. Given that the trails are true single track, please be courteous to your fellow participants. If someone wishes to pass you, step off the trail and let them pass or make room in some other way. Likewise, if you intend to pass someone, make your intentions known before passing by saying “Passing on your left!” or something equivalent to that. Be polite! Be aware that the trails are also frequently used by mountain bikers and there are many blind turns. Runners must yield the right of way to mountain bikers! It is easier for you as a runner to step off the trail than for someone on a bike to slow down or stop entirely. All runners are required to be courteous to EVERYONE and yield the right of way to all pedestrians, fishermen and anyone else not associated with the Fort Clinch 100! All cut-off times will be strictly enforced. Even if you complete the mileage, in either the 50 or 100, you will not be listed as a finisher or receive a finisher award after the final cut-off times. 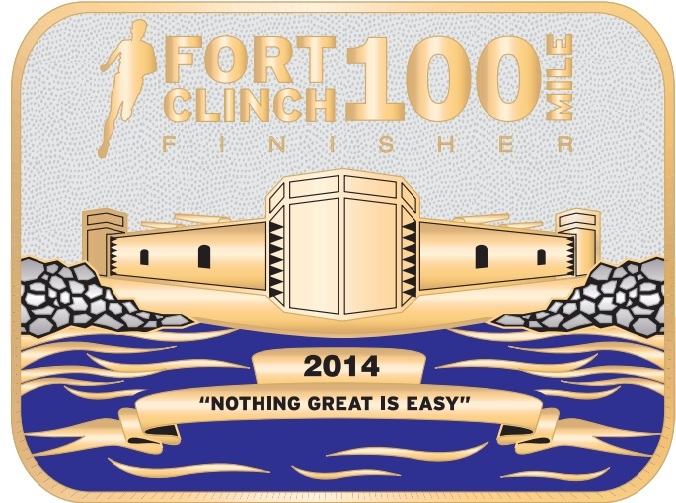 The Fort Clinch 100 is committed to keeping ultrarunning a clean, drug-free sport. Use of performance enhancing drugs or blood doping as defined by the USADA is forbidden. The Race Director reserves the right to disqualify a runner based on competent evidence of such use. While there will be no testing at the FC100, in the event that a runner who participates in this race is caught using PEDs, EPO or any other banned substance, at any indefinite future point after the FC100, it will be assumed that said participant was also cheating during the FC100. The offending runner will be banned from all future LRC events, the runner’s performance stats will be removed from official results. If it is determined that a runnerdefinitely used PED’s or doped during a period of time in which they participated in the FC100, any money or prizes awarded to said runner must be returned and/or paid back to LRC immediately. The offending runner will be banned from all future LRC events, the runner’s performance stats will be removed from official results. Violations of any of the above rules may result in runner disqualification, including the possibility of banishment from any future LRC event. Report the alleged violation in writing at HQ to the Race Director. All protests must be submitted by 2:30 p.m. on Sunday following the race. Written protest must include the name of the person who lodged the complaint. Both parties will be invited to discuss the complaint with the Race Director at 3:00 p.m. on Sunday, when a decision about whether to withhold the alleged violator’s award will be rendered. A final resolution of the issue may be made by the Race Director within one month after the race.